The ADAS and autonomous driving component market is anticipated to grow at a CAGR of 22.31% during the forecast period 2018-2028. The automotive industry is in the process of constant evolution since its origin in the nineteenth century. The increasing number of on-road vehicles provide immense number of opportunities as well as also leads to complications for safer and more secure movement of goods and passengers. In the recent times, there have been many technological advancements in the automotive industry, which in turn, is expected to further advance the concept of vehicle safety on public roads. The dynamic evolution of the automobile industry is attributed primarily to the changing consumer preferences, growing focus towards driver safety, environmental concerns, and stringent government regulations which are focusing towards crash avoidance rather than crash survival. In the past years, automobiles have undergone rapid technological advancements in terms of vehicle performance, passenger safety, communication capabilities, and driving comfort. These improvements have led to a surge in the number of on-road vehicles, thus raising the need for the safer movement of automobiles. These goals of automakers are profoundly supported by several federal authorities such as “National Highway Traffic Safety Administration” (NHTSA), “European Commission” (EC), and “Ministry of Land, Infrastructure, Transport and Tourism” (MLIT), among others. This is expected to advance the vehicle safety on public roads with an early integration of advanced driver assist systems (ADAS) in automobiles. Considering ADAS as the founding stone, automakers are expected to advance to semi-autonomous vehicles and ultimately, towards fully-autonomous vehicles. The ADAS and autonomous driving components market is also proportionally relative to the development of the autonomous vehicles. The need for safety, rising demand for luxury cars as a result of the increasing disposable income of the developing countries, and stringent government regulations have influenced the autonomous vehicle market to substantially enhance its sales, which has subsequently propelled the growth of its components. The ADAS and autonomous driving component market is anticipated to grow at a significant rate during the forecast period 2018-2028. The growth is attributed to the rise in demand of autonomous driving solution for passenger cars such as auto pilot, lane departure system, and blind spot detection, among others, along with growing emphasis toward road safety, rapidly increasing number of automated vehicles, reduction in road congestion, and growing demand for safety sensors. North America dominated the global ADAS and autonomous components market with a prominent share in the year 2017. Factors such as initiatives made by the federal bodies to increase road safety standards, high demand for automated cars, and increased manufacturing activities in the U.S. and Canada are expected to propel the growth of the autonomous vehicle market in the region. Thus, this increase in autonomous vehicle will boost the ADAS and autonomous driving components market in North America. Additionally, increasing number of high-end passenger cars (ADAS vehicles) such as BMW, Audi, Mercedes Benz, and Volvo among others is expected to boost the market growth. The ADAS and autonomous driving component market in the APAC is expected to grow at a faster rate in comparison to Europe and North America between 2018 and 2023. Factors such as the growing automotive industry, rising disposable income, and increasing manufacturing facilities are some of the factors contributing to the growth of the market in the APAC region. Additionally, factors such as stringent government rules and regulations for road safety boost the market growth. The key players in the global ADAS and autonomous driving component market are Autoliv Inc., Continental AG, Aptiv PLC, DENSO Corporation, Magna International Inc, Murata Manufacturing Co. Ltd, Quanergy Systems Inc, Robert Bosch GmbH, Valeo, Velodyne Lidar, and ZF Friedrichshafen AG, among others. These companies adopt different strategies such as business expansions, product launches, and product developments, among others in order to enhance its market share and to increase its geographical foothold. 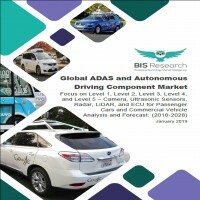 This report is a meticulous compilation of research on different segments of approximately 150 players in the ADAS and autonomous driving component market including market breakdown by component type, vehicle type, level of autonomy, and geography. The report further takes into consideration the market dynamics and the competitive landscape. Moreover, it draws upon insights from in-depth interviews of key opinion leaders of more than 25 leading companies, market participants, and vendors. The report also profiles around 18 companies which are key contributors in the market, including Analog Device, Inc, Infineon Technologies AG, Intel Corporation, NXP Semiconductors, Texas Instruments Incorporated Continental AG, Ibeo Automotive Systems GmbH, Robert Bosch GmbH, Denso Corporation, LeddarTech, Quanergy Systems, and Velodyne LiDAR, Aptiv, Autoliv, Inc., Magna International Inc., Murata Manufacturing Co., Ltd, Valeo, and ZF Friedrichshafen AG. • What is ADAS and autonomous driving? • How big is the ADAS and autonomous driving component market in terms of revenue and what is the CAGR (2018-2028)? • What is the revenue generated by the different levels of autonomy such as level 1, level 2, level 3, level 4, and level 5? • What is the revenue generated by the different vehicle types such as passenger cars and commercial vehicle? • What is the revenue generated by the different ADAS and autonomous driving component such as camera, ultrasonic sensors, radar, LiDAR, and ECU? • What is the revenue generated by the different regions such as North America, Europe, Asia-Pacific, and Rest-of-the-World (RoW)? • Which are the key companies operating in the ADAS and autonomous driving component market? • Which global factors would impact the ADAS and autonomous driving component market? • What are the key market strategies adopted by the ADAS and autonomous driving component market players? 9.11 Murata Manufacturing Co., Ltd. Figure 6: Global ADAS and Autonomous Driving Component Market Size, by Geography, 2017 & 2028 ($Million). Figure 2.4: Number of Level 4 and Level 5 Autonomous Vehicle, 2020-2028 (Thousand Units). The automotive industry is in the process of constant evolution since its origin in the nineteenth century. The increasing number of on-road vehicles provide immense number of opportunities as well as also leads to complications for safer and more secure movement of goods and passengers. Currently, there have been many technological advancements in the automotive industry, which in turn, is expected to further advance the concept of vehicle safety on public roads. Rising number of road accidents have resulted in increased regulations by federal authorities with regard to the safety of both, the passengers and the pedestrians. These guidelines have led to a rise in the demand for the driver assistance feature in the automotive industry. In addition to this, constantly changing consumer preferences towards better driving experience and driver assist applications has boosted the demand for ADAS and connected vehicle systems, in the automotive industry. A visible surge can be witnessed in the number of vehicles with automated features such as adaptive cruise control, parking assistance, lane departure warning, traffic jam assist, automated emergency braking, and blind spot detection. These automated features when combined with telematics and connected car features will lead to the development of fully autonomous or human independent vehicles. The ADAS and autonomous driving components market is also proportionally relative to the development of the autonomous vehicles. The need for safety, rising demand for luxury cars as a result of the increasing disposable income in the developing countries, and stringent government regulations have influenced the autonomous vehicle market to substantially enhance its sales, which has subsequently propelled the growth of its components. The ADAS and autonomous driving component market is anticipated to grow at a CAGR of 22.31% during the forecast period 2018-2028.The ADAS and autonomous driving component market is driven by several factors such as growing emphasis towards road safety, rapidly increasing number of automated vehicles, reduction in road congestion, and growing demand for LiDAR sensors. However, factors such as high price of ADAS and autonomous driving components, high risks associated with autonomous components, and security concerns toward vehicle’s data hampers the market growth. Moreover, factors such as increasing adoption of autonomous components among different levels of automation, high anticipated growth rate for component manufacturers, and high potential growth for semi-conductor companies in the automotive industry is anticipated to create numerous opportunities for the market growth. The automotive industry has grown organically and is on a transitional shift from traditional mechanism to autonomous driving, which boosts the demand of components such as camera, ultrasonic sensors, radar, LiDAR, and ECU. ECU dominated the global ADAS and autonomous driving component market and contributed a major share of the total market in 2017 and is expected to continue its dominance throughout the forecast period. This is mainly due to the higher cost of ECU as compared to other components such as camera, ultrasonic sensors, radar, and LiDAR. Additionally, growing number of sensors and electronic components is anticipated to boost the demand for ECU. Owing to the critical nature of autonomous systems and need of development for effective sensors, automotive industry witnessed the introduction of LiDARs. It offers a greater range, wide field of view and improved accuracy to spot the obstacles when compared to other object sensing components such as camera, radars, and ultrasonic sensors. Therefore, LiDAR market is expected to grow at a fastest rate during the forecast period in comparison to the other components of ADAS and autonomous driving component. Depending upon the levels of automation- Level 1 dominated the global ADAS and autonomous driving component market and contributed a majority share of the total market in 2017 and is expected to continue its dominance throughout the forecast period. This is mainly due to higher penetration of ADAS features in passenger vehicles such as adaptive cruise control, glare-free high beam and pixel light, adaptive light control, and automatic parking, among others. Market for level 4 and level 5 components is comparatively new as compared to the other levels of automation. However, the expected increase in the number of level 4 and level 5 prototypes and commencement of level 4 and level 5 automated vehicles in the future years is anticipated to increase the components market at a rapid growth rate. ADAS and autonomous driving components are integrated with passenger cars and commercial vehicles. The passenger car segment was estimated to be the largest contributor to the overall market revenue in 2017. High production rate and registration of high-end passenger cars in comparison to commercial vehicles also forms an important factor for generating high market revenue. Also, integration of large number of autonomous system in passenger cars, as compared to commercial vehicles boosts the market growth. Additionally, passenger car segment is expected to grow at the fastest rate during the forecast period. The major factors such as the growing sales of level 1 and level 2 passenger cars, especially in the emerging countries, increasing disposable income, and technological advancements in ADAS and autonomous driving industry boost the overall market for passenger cars. The market for commercial vehicles is expected to increase at a rapid pace, due to the focus of federal organizations such as European Commission, Ministry of Land, Infrastructure, Transport and Tourism (MLIT) on decreasing road accidents and mandating ADAS features in commercial vehicles. Geographically, North America accounted for the highest market share in the year 2017, owing to rise in luxury vehicle sales and increasing testing of level 4 and level 5 autonomous vehicles. Factors such as initiatives made by the federal bodies to increase road safety standards, high demand for automated cars, and increased manufacturing activities in the U.S. and Canada are expected to propel the growth of the autonomous vehicle market in the region. Thus, this increase in autonomous vehicle will boost the ADAS and autonomous driving components market in North America. Additionally, increasing number of high-end passenger cars (ADAS vehicles) such as BMW, Audi, Mercedes Benz, and Volvo among others is expected to boost the market growth. The ADAS and autonomous driving component market in the APAC is expected to grow at a faster rate in comparison to Europe and North America between 2018 and 2023. Factors such as the growing automotive industry, rising disposable income, and increasing manufacturing facilities are some of the factors contributing to the growth of the market in the APAC region. Additionally, factors such as stringent government rules and regulations for road safety boost the market growth. The global ADAS and autonomous driving component market has witnessed several strategic and technological developments in the past few years, undertaken by the different market players to attain their respective market shares in this emerging domain. Some of the initiatives taken by players in component market include new product launches, precise and secure systems, pricing strategies, acquisitions of small-scale start-ups and emerging players, and formation of partnerships among the major players of the automotive components industry. The key players in the global ADAS and autonomous driving component market are Autoliv Inc., Continental AG, Aptiv PLC, DENSO Corporation, Magna International Inc, Murata Manufacturing Co. Ltd, Quanergy Systems Inc, Robert Bosch GmbH, Valeo, Velodyne Lidar, and ZF Friedrichshafen AG, among others.